Since one of the secrets to aging gracefully is staying active, it is fitting that seniors and those who wish to live long enough to become seniors get out there and commemorate National Senior Health and Fitness Day. Observed annually on the last Wednesday in May, around 100,000 senior citizens will participate in activities in more than 1,000 locations across the US. This year is the 25th Anniversary of National Senior Health and Fitness Day, whose common goal is to keep older adults fit and healthy. As the largest annual health and wellness event for older adults, special events are offered at many organizations throughout the country, such as gyms, banks, senior centers, shopping centers, malls, hospitals and more. To no surprise, an ideal, and perfect place for people of all ages to spend NSHFD is in a ballroom dance studio. With ballroom dancing already being a popular activity across different age groups (particularly among the older adult population), it’s a perfect fit. A recent Saint Louis University study conducted by Jean Krampe, Ph.D., concluded that after engaging in a 12-week, low-impact dance program, participants with an average of 80 years old were able to decrease the amount of pain medication they were taking by 39%. This is a significant breakthrough in pain management and health care as a whole, demonstrating how some seniors can essentially swap of their pain medications for dancing shoes. This is just one of the many benefits of dancing, particularly for aging populations. Come on into ATOMIC or your local ballroom to commemorate senior day with your favorite dance, or perhaps even try a new dance style. You don’t have to be a senior to join in, anyone can join the fun, as it’s never too late or too early to start dancing. 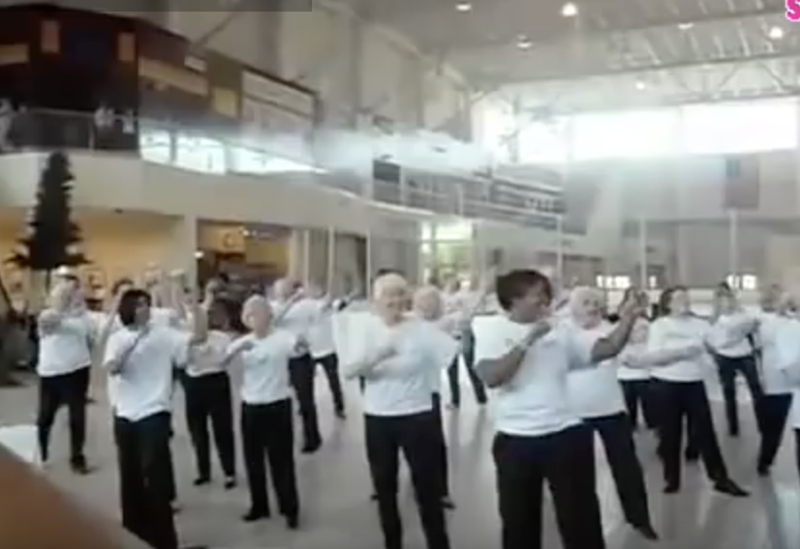 To show support, help spread the word by inviting a senior to a dance class or social, or simply use the hashtag: #Senior Health Fitness Day, across social media.